My first traditionally published picture book A Book For Bramble was inspired by the work I do with a hedgehog rescue centre, Herts Hogline. One winter whilst checking on a hedgehog that was hibernating I began to wonder what they dream about. I jotted down a story about the dreams Bramble might have. 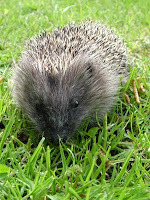 Six re-drafts later my story became a small mouse missing his hibernating hedgehog friend. One of my first picture book apps and eBooks came from watching my dog (Tasha) share her home with a friend's dog, Mac. Although I'd taken away bones and toys to avoid fights, they still found things to share. From my observations I jotted down a story, that after several re-drafts became the story of Captain and Nugget. 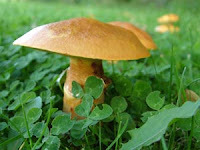 My first young readers novel (availbale as an eBook), Maras and the Fairy Rings came from my love of the natural world. Each autumn I gain pleasure from seeing the fairy rings (a form of fungus) 'flower' on our local fields. Wondering why they are called fairy rings I did a little research. From this emerged a modern fairy story featuring my main character Maras Mius (the name comes from the genus name for this type of fungus, Marasmius). At the moment I'm editing a young readers novel, which includes photography and time travel. I have another story sketched out that involves ASBO kids, animal rescue and memories of an old man. I also have an idea for a story about ghost dog and a boy, (the result of a throw away comment at a concert) and a story of a swallow, which came from watching Autumn Watch (a programme on the BBC). So my problem is not having the idea but the time to write the stories these ideas generate!